At Mabie Forest we provide a safe, clean environment for every dog staying with us. Each individual kennel is spacious and heated, we offer various size of kennels which means dogs from the same family can stay together. 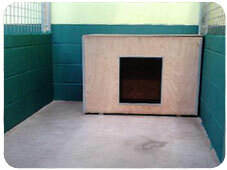 We also have four 'family' kennels which can house up to four medium dogs or two giant dogs. Owners are welcome to bring their dogs own food and bedding but we are more than happy to provide this. At Mabie Forest we try to match your dogs diet at home as closely as possible with our range of top quality foods from Downland Working Dog Dry’ and choice of pedigree wet tins, chappie wet tins or downland wet tins for dogs. This dry dog food is hypo-allergenic, wheat/gluten free and contains human grade meat. For more information see the FAQ section of the site. For information on our terms and Conditions click here.